Shake in style with this high quality shiny metallic hip scarf with intricate bead work and coins. Shake in style with this high quality shiny gold metallic hip scarf with intricate gold bead work and coins. The metallic base makes this a perfect match for almost any gold belly dance costume. 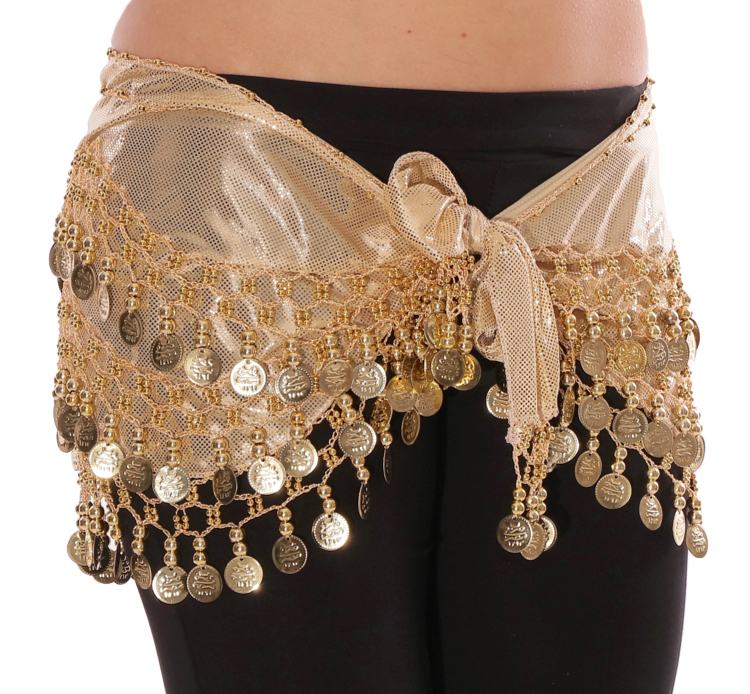 A must - have for any classic belly dance wardrobe! Made of lightweight polyester stretch fabric with metallic mini-dot overlay print. Total width (end to end)- 57 - 60 inches, Decorated section- 37 inches, Length (not including coins) - 8.75 - 9 inches. I love it beautiful and glitzy! A: Hi Joy, The beautiful hip scarf is made of a lightweight polyester stretch fabric and has a metallic mini-dot overlay print with gold coins. I hope this helps. Q: Is there any way to get this in plus size? A: Hi Mellisa, we currently only carry this hipscarf in one size. The measurements can be found in the item description below the photos. We do carry this color in a beautiful, lush velvet hipscarf in plus size, item #7831.